A Geometry Behavior (crowdBeGeometry) changes the source FBX or GCG geometry during a simulation or play a FBX / GCG baked animation. This behavior allows dealing with different level of details in term of geometry and/or play animations which are not supported yet by the animation engine (cloths, flags…). Notice that Geometry Behavior animation is not always supported correctly by the Render Previz display mode. To see the result of a Geometry Behavior, it's advised to render the frame instead. A Geometry Behavior defines the following specific attributes. For common attributes see Behavior Common Attributes. Animation Stop Frame Frame at which the animation will stop/loop. 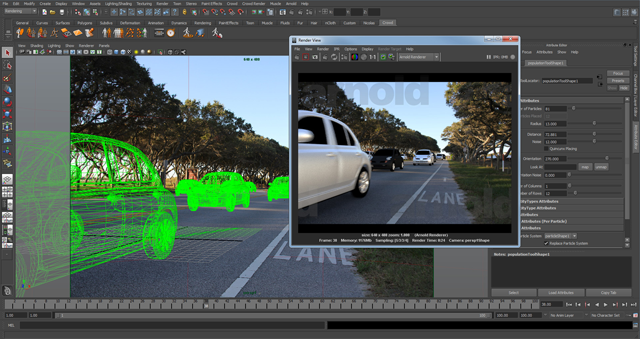 N/10th frame subsample Controls at which rate the geometry must be subsampled (useful for motion blur). Valid range is 1/10 (keep tenth of frame information in cache for motion blur) to 10/10 (full rounding in cache). Blend Behavior If this box is checked, the geometry animation will be blended with the animation generated by other behaviors (such as CrowdBeMotion…). If not, the geometry animation will be played as it is stored in the geometry file. Per particule attribute: Use "Frame Steppp Name" attribute to get the name of the float per-particle field of the relative particle system, containing the frame step which will be applied on the source geometry per frame (per default, one geometry frame played per simulation frame). To learn more about per particule attributes, see ppAttributes Handling. 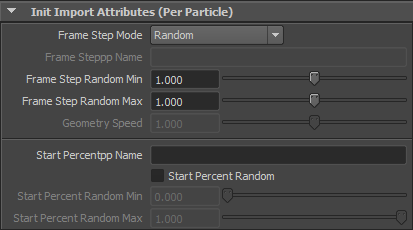 Start Percentpp Name Name of the float per-particle field of the relative particle system, containing the value of the start percent in the animation (between 0. and 1.). If none is given and if the Start Percent Random box is not checked, the motion will start at its beginning (0.). To learn more about per particule attributes, see ppAttributes Handling. Notice that when sequencing two Geometry Behaviors, Golaem Crowd is not able to compute a transition between the two behaviors. It's up to you to provide a transition Geometry behavior in between if required (see image below).